The 3 Valleys Escapade in a Day – still going! The first attempts of Winter 2019 have taken place with a success from Dougie B and a close call from Henry and Ross (not Ade!) who missed Foret (the last lift) by 3 minutes! I completed L’Escapade on Tuesday 22 January (just). Start time 0905, just made it to the Foret lift at 1627 (the last chair up!). Route and ski data attached (only switched on the app on Saulire, but hit La Tania, Bouc Blanc and Rocher De L’Ombre to get there). Data attached is from Saulire onwards. Much harder than I’d expected! Didn’t stop all day except to get a snickers bar at Pointe De La Masse and only just made it. Made a navigation error on the way to Meribel Village (missed the right on to Lapin and ended up at Morel) and Cime Caron was closed so had to find an alternative route to Bouchet – but otherwise skied pretty hard. This is no longer being promoted by The 3 Valleys but we’ll still stick you in the Hall of Fame if you complete it – send a Ski Tracks or similar trace in plus a pic of your group. 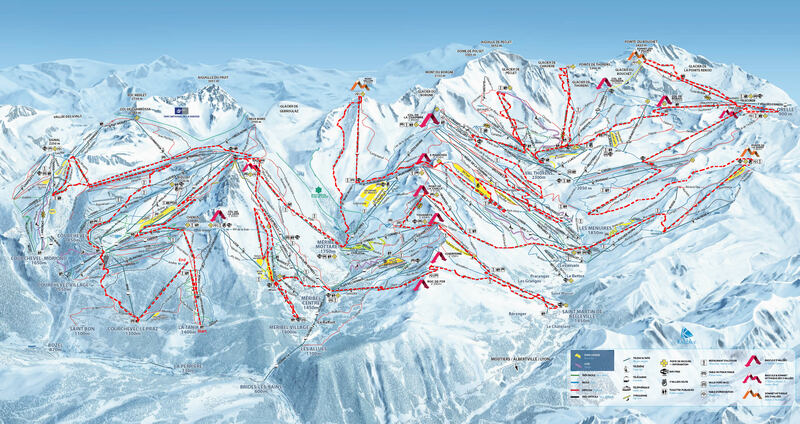 PDF list of lifts here for downloading to a smart phone – this needs a 2019 update as Roc de Tougne chair is not a drag now, Legends replaces Roc de Fer and the drag in Les Menuirs, Montaulever is no longer there. Hi! Is there an uptodate lift list for 2019 attempts? e.g. Montaleuver doesnt exist anymore.